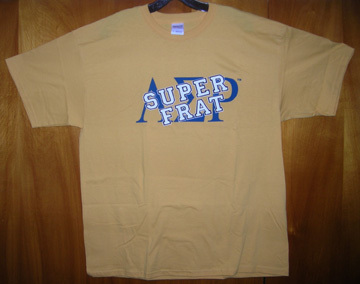 Don't just read Super Frat, now wear it with these stylish T's in Xtra Large! You can order by clicking the "Buy Now" button and paying via Paypal or your credit card. If you need a comic book, visit the Silent Devil store! Show the new bros you mean business, even if hazing is still illegal. Ira's shirt is now available and lucky for you we made him wash it first. You can't be invisible, but you can dress like our invisible Anarchist! 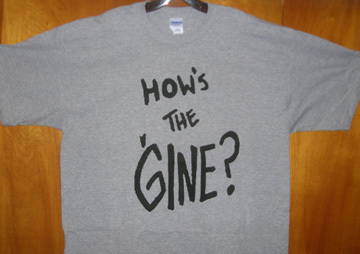 "How's the 'Gine?" 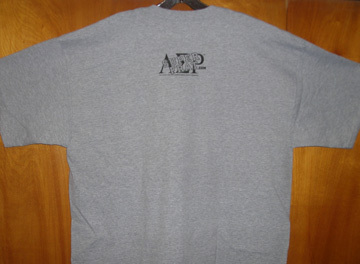 is in angry sports grey and comes with a little Super Frat logo on the back. 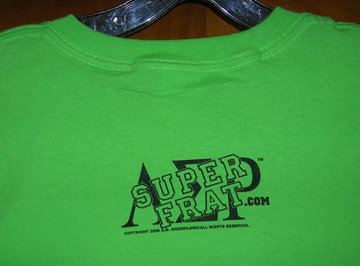 Return to the Super Frat website! Visit Tony's store for his other comics! On one side, the Lambda Sigma Rho letters. On the other, your favorite Super Frat strip! They are homemade and certified by 2nd Assistant Pledgemaster Tony D! Only $25.99 plus S&H! 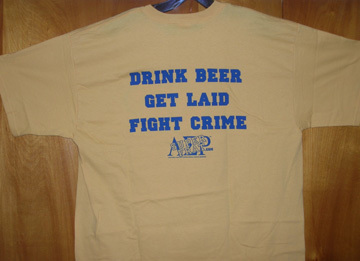 Our motto, "Drink Beer, Get Laid, Fight Crime" on the back! It's like two shirts in one! XL only $20 plus $6 shipping and handling. It's green because you love, um, nature. Yeah! Nature! That's it! We also added a little Super Frat logo in the back so all your friends will ask, "What that little thing on the back?" 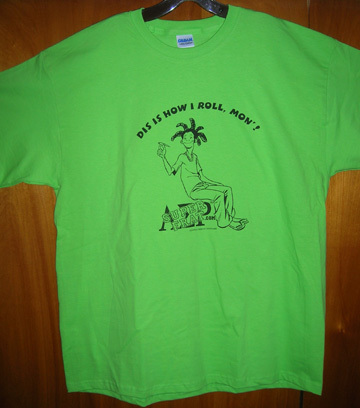 Comes in glorious XL for $20 plus $6 shipping and handling. XL only $20 plus $6 shipping and handling. Send Tony an email at imfix@comcast.net to inquire about special orders and orders outside the United States.